Mike Trombley earned his bachelor’s and master’s degrees at Wright State University. His master’s thesis centered on one of his attempts at creating a reverb effect. His background is in electrical engineering and computer programming, a useful combination for someone building digital electric effects. A Wright-Patterson Air Force Base electrical engineer has stepped into the competitive market of electric guitar effects pedals, helping guitarists shape their sound — and creating a new business along the way. Mike Trombley, 26, is a Troy resident and owner of Red House Electronics. 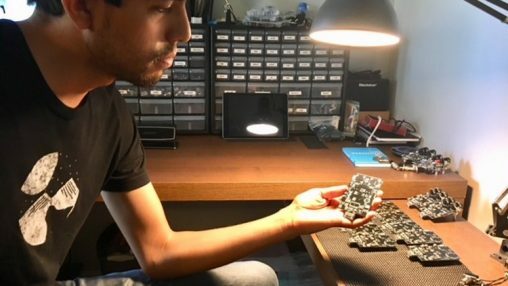 He builds pedals in what might be considered the classic way, chasing a sound he feels he can’t get from other pedal companies. Alexander Scaglia — a former Springfield resident now based in Cincinnati — helps design the pedals, which can be found online and in some area music stores, including Trojan City Music in Troy and Lester’s Rock N Roll Shop in Middletown. Observers agree this is a challenging time for the guitar market. Guitar Center was $1.6 billion in debt last year, according to the Washington Post, and Gibson Guitar filed for Chapter 11 bankruptcy protection in May. But some pedal builders say their own market has been surprisingly durable. The little sound-processing boxes that electric guitars connect between their instruments and their amplifiers is crowded but growing, by some accounts. According the National Association of Music Merchants, from 2005 to 2015, the retail value of the effects pedal category increased more than 45 percent, with a 13.7 percent gain in 2014. Trombley, of Native American heritage, grew up on reservations out West before his stepfather brought his family to Troy. His pedals’s designs and art are a nod to that heritage. He earned his bachelor’s and master’s degrees at Wright State University. In fact, his master’s thesis centered on one of his attempts at creating a reverb effect. His background is in electrical engineering and computer programming, a useful combination for someone building digital electric effects. And of course, Trombley plays guitar. His pedals cover fuzz, reverb, overdrive and phasing sounds. That’s familiar territory for pedal-builders, but Trombley feels he offers guitarists flexibility in simple, easy-to-use packages. “To really shine in the pedal market, you have to be unique,” he said. He started building pedals for friends in the Dayton area, and their feedback was encouraging. While there are plenty of engineers who can design circuits, not every engineer will understand what a guitarist means when he or she says they’re searching for a “warmer” sound. “Mike is incredible,” said Scaglia, who studied graphic design at Clark State Community College. Phil Doncaster, who works at Trojan City Music, has long been impressed with Trombley. “He couldn’t be a nicer guy, and he’s extremely smart,” Doncaster said. Trombley will sometimes bring his computer to Trojan City to update his pedals, which feature digitally processed effects but an analog “dry-through” signal path that leaves the guitarist’s core sound intact. “And he’s a hell of a player,” Doncaster added. Trombley said that so far, his expenses have been covered by his sales. He programs the effects software and surface-mounts components on his circuit boards himself. His pedal box drilling, powder coating and screen-printing is performed by a company in Oklahoma. “From the time I get home until the time I go to sleep, this is kind of what I do,” he said.